Connector selection has become a serious challenge for unmanned systems design engineers who need to find ways to deliver increasing amounts of data through smaller and smaller spaces. Designers of unmanned aerial vehicles (UAVs), unmanned ground vehicles (UGVs) and other robotic platforms often need to figure out how to run power and data in one connector/cable combination without interference. Fischer Connectors has released a new white paper that guides designers through the challenges and priorities faced when selecting rugged connectors for new designs. The details of the design considerations required for rugged connector selection are many and varied, and such connectors will often be custom designs rather than off-the-shelf. A manufacturer that focuses on rugged connector applications will often be able to guide engineers beyond the basics and fine-tune the details for a precise application. 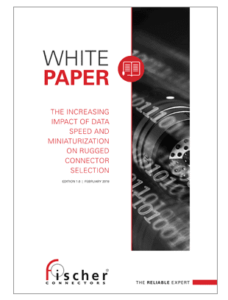 To learn more, download the free white paper produced by Fischer Connectors here.